A man who isn’t afraid of vegetables is a man who gets my attention. And I’ll make a point to see him. I may have found that special man (with Chris’ blessing, I promise!) in Jamie Perry, the new chef-owner of Another Fork in the Road on Route 199 in Milan, Dutchess County, the next town over from Rhinebeck, where Marc and Chelsea wedding mania has raged. This spring, Jamie bought the Fork from its previous owner, who has since moved to Maine. The original premise of this breakfast-and-lunch spot, which he helped open in 2008, was a “finer diner” that sources locally. But Jamie, who had cooked at three-star Montrachet in Manhattan and Swoon in Hudson, Columbia County, was itching to flex his fine dining muscles in the kitchen. In May, he began serving dinner on Fridays and Saturdays. We came. And discovered the many ways he pays delicious tribute to local vegetables, many from just down the road. BTW: I’m an omnivore who enjoys meat and fish—not a vegetarian, a vegan, or, god forbid, a raw foodie(!). I am, however, suffering from protein fatigue syndrome. Maybe it’s because restaurants are still male chef dominated. Maybe it’s because Americans, with their insatiable appetite for protein, will take their meat—however they can get it. Which would explain on-trend “meaty” desserts, like bacon ice cream and fois gras-flavored macaroons. The point is: at Fork, we love Jamie’s unapologetic inclusion of local vegetables on a daily-changing menu. (ps: The braised greens are divine when paired with a succulent North Wind Farms pork chop). I‘ve fallen especially hard for his salads. 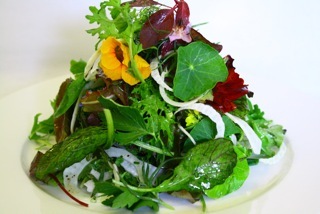 The nasturtium-topped “local green salad”, an artfully presented mound of Sky Farm greens, embellished with shavings of fennel and kohlrabi from Jamie’s vegetable garden, was delicately piquant—complemented by a citrus-based vinaigrette of lemon, shallot and Dijon mustard. On the menu: Jamie's "Local Green Salad"
Baby beets, wild arugula, olives and almonds, married by an orange-infused vinaigrette, offered a delightful interplay of textures and Mediterranean-inspired sweet, salty and bitter flavors. Bite me…. Yum! And, with every gentle crunch of a mint-flecked sugar snap pea (from local farmer Kenny Migliorelli), feta and toasted walnut salad, I tasted summer. Kudos, Jamie! You’ve restored my faith in men who remain faithful to vegetables. 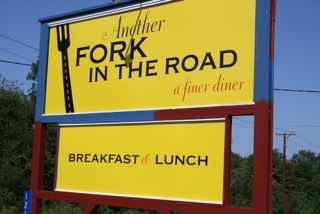 Another Fork in the Road, 1215 Route 199, Milan, NY 12571; Tel: 845-758-6676; Hours: Thurs & Mon: 8am-3pm; Fri & Sat: 8am-8pm; Sun: 8am-4pm; Closed Tue & Wed. This entry was posted in Hudson Valley, Local Food, Restaurants and tagged Hudson Valley local, Hudson Valley produce, Hudson Valley restaurants, Milan. Bookmark the permalink.